This extraordinary vintage pen is a 1945 Colorado Double-barreled, double nibbed piston filler in Silver Laminated with “scissor” barrel configuration. Features nickel plated trim. Red dot & white dot on gripping sections so you know which side has which color ink is in each barrel. Incredible pen, almost never found in this condition. Shown open. The scissor “swivel” allows the user to fill each of the two reservoirs separately. Medium nibs. Near mint+ (could be new-old-stock). Item #2 in Catalog #85. 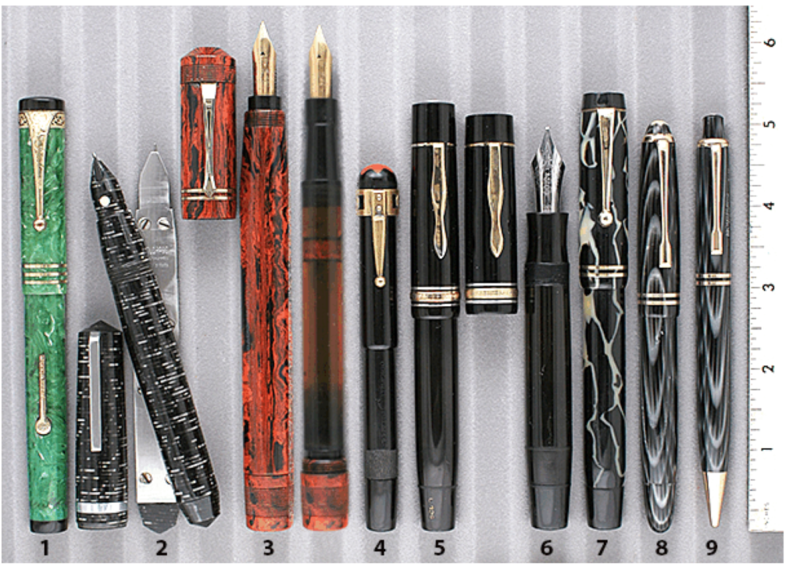 This entry was posted in Vintage Pen, Vintage Pens and tagged Catalog, Catalogs, Colorado, Extraordinary Pens, Fountain Pens, Go Pens, GoPens, Vintage Fountain Pen, Vintage Fountain Pens, Vintage Pen, Vintage Pens. Bookmark the permalink. Follow any comments here with the RSS feed for this post. Post a comment or leave a trackback: Trackback URL.